Engine/Powertrain Specifications: Preliminary engine specifications for the 2014 C7 Corvette. Engine - Press Release: 2014 Corvette Stingray Cranks Out 460 Horsepower. Exhaust System - Tenneco Press Release: Tenneco Supplying Emission Control Technologies on 2014 Corvette Stingray. Gallery: GM Media: A gallery of high-resolution photos of the 2014 C7 Corvette Stingray from GM Media. Gallery: NAIAS: A gallery of high-resolution photos of the 2014 C7 Corvette Stingray from the official unveiling at the North American International Auto Show, January 2013. Gallery: Spy Shots: Spy shots of the 2014 C7 Corvette Stingray from the official unveiling at the North American International Auto Show, January 2013. Instrument Cluster - Press Release: Too Much Information? Not from Corvette Stingray. Knowledgebase: GM Techlink articles, service bulletins and information, and more on the C7 Corvette. Official 2014 Corvette Site: Chevrolet's official web site for the 2014 C7 Corvette Stingray. Performance - Press Release: 2014 Corvette Stingray: 3.8 seconds from 0 to 60 mph. Performance Summary: A summary of performance numbers for the 2014 Corvette Stingray. Preliminary Specifications: 2014 Chevrolet Corvette Stingray Preliminary Specifications. Press Release - Convertible: GM officially confirms the 2014 C7 Corvette Stingray Convertible for Geneva Motor Show. Press Release: All New 2014 Corvette Stingray LT1 V-8 a Technological Powerhouse. Press Release: 2014 Chevrolet Corvette is all About the Aero. Press Release: Return of the Stingray: The 2014 Chevrolet Corvette Stingray. Press Release: Corvette: 60 Years of Design, Performance and Technology. Press Release: All-New 2014 Corvette Stingray LT1 V-8 a Technological Powerhouse. Press Release: 2014 Corvette Stingray Hits the Track in Gran Turismo 5. Press Release: Return of the Stingray: The 2014 Chevrolet Corvette. Press Release: Corvette Shines in the Big Apple - All-new Corvette Stingray comes to New York City 60 years to the day after Motorama debut. Press Release: First 2014 Corvette Stingray Offered at Barrett-Jackson. Press Release - 02-12-2013: Chevrolet Debuts Lightweight 'Smart Material' on 2014 C7 Corvette Stingray. Press Release - 03-05-2013: Chevrolet Lifts Lid on 2014 Corvette Stingray Convertible. 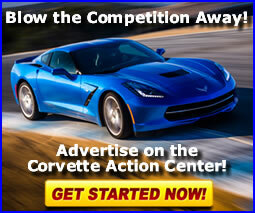 Press Release - 04-26-2013 - Pricing: 2014 Corvette Stingray Starts at $51,995. Press Release - Seats - Corvette Seat Performance Proven Under Pressure: Customized test procedures used during development of Stingray’s new seats. Sales Guide: Dealer sales guide for the 2014 Corvette Stingray. Something Wicked This Way Comes: The 2014 C7 Corvette Stingray is Unveiled: The Corvette Action Center takes an up close and personal look at the C7 Corvette and interviews the key players behind it. Unveiling Remarks: A full transcription of the 2014 C7 Corvette Stingray Reveal Remarks by Mark Reuss and Ed Welburn. Unveiling Video: Video of the official unveiling of the 2014 C7 Corvette on January 13, 2013 in Detroit. Videos - C7 Corvettes: C7 Corvette videos provided by our sister site - VetteTube.com.